3 piece casual pantsuit. Flared pants, cami, long sleeveless airy vest in an abstract pattern. 2 piece casual pantsuit. Pants with lace blocks. Top with lace flared sleeves and shoulder cut-outs. 3 piece suit. Cami and skirt with open jacket, contrast collar in Royal Blue, and slit cuffs. 3 piece suit. Cami and straight skirt, jacket with white trim and slit cuffs. 2 piece suit. Classic straight skirt with modern double breasted jacket and slit cuffs. 3 piece suit. Cami, straight skirt, double breasted jacket with flared sleeves. 3 piece suit. Cami and straight skirt. Classic notched lapel jacket with one button and slit cuffs. 3 piece timeless suit. Cami and straight skirt. Classic one button, notched lapel jacket. 3 piece suit. Cami and straight skirt. Classic notched lapel jacket with one clasp closure. 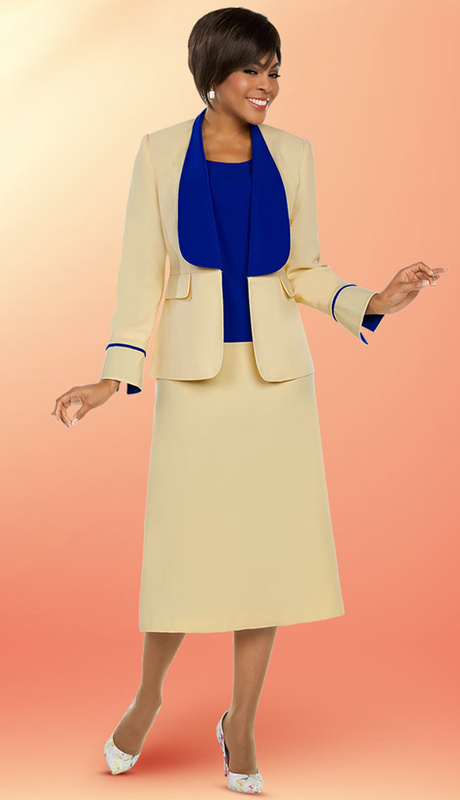 2 piece dress and waist length, collarless jacket. Both with navy contrast trim. 3 piece suit. Pencil skirt and cami. 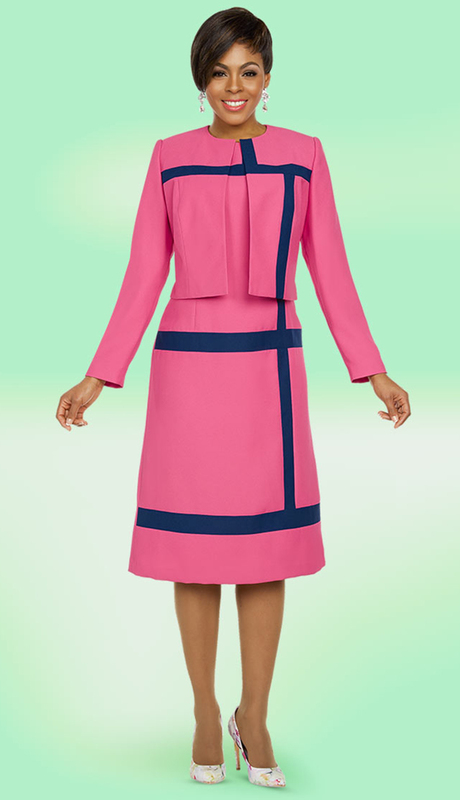 Modern, waist length jacket with metallic square pattern on sleeves. 3 piece suit. Long straight skirt and cami. 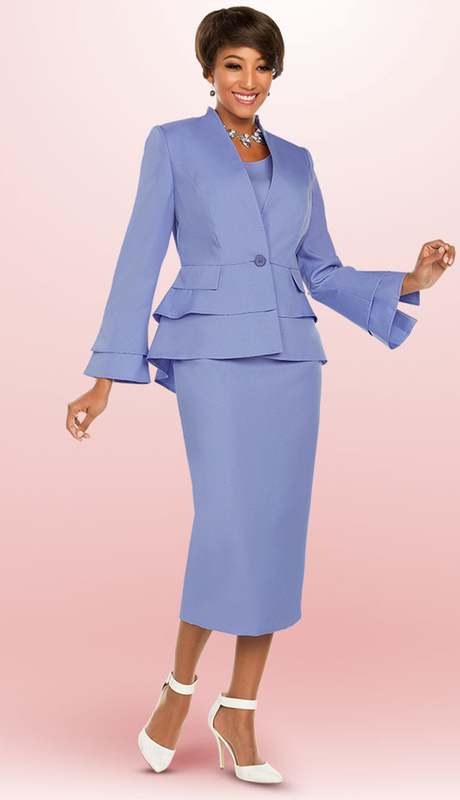 Collarless peplum jacket with flared sleeves. 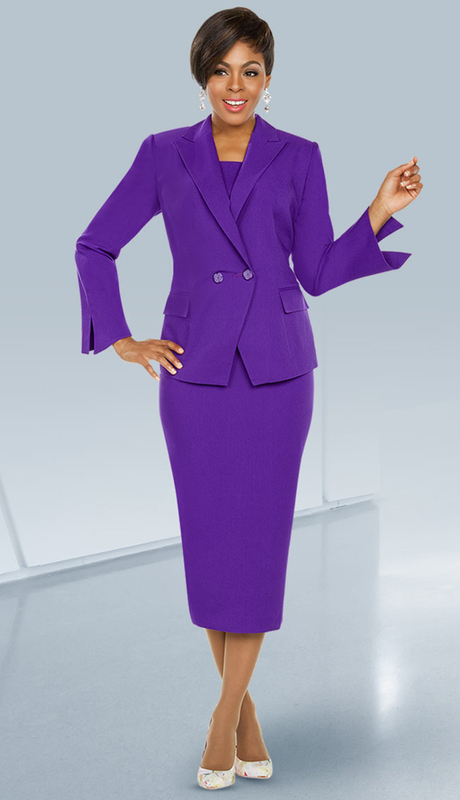 3 piece timeless pantsuit. Cami with classic pants and two button, notched lapel jacket. 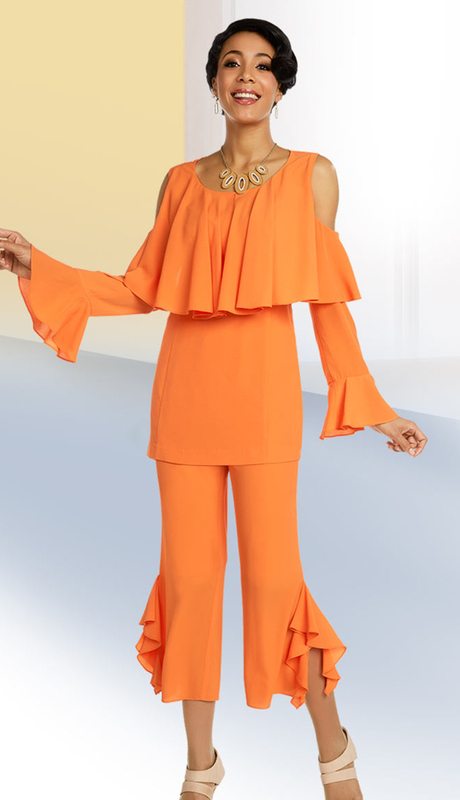 3 piece pantsuit. Classic straight pants and one button notched lapel jacket. Cami with navy neckline trim. 3 piece pantsuit. Cami, straight pants, open loose jacket in micro-check pattern with gold edging. 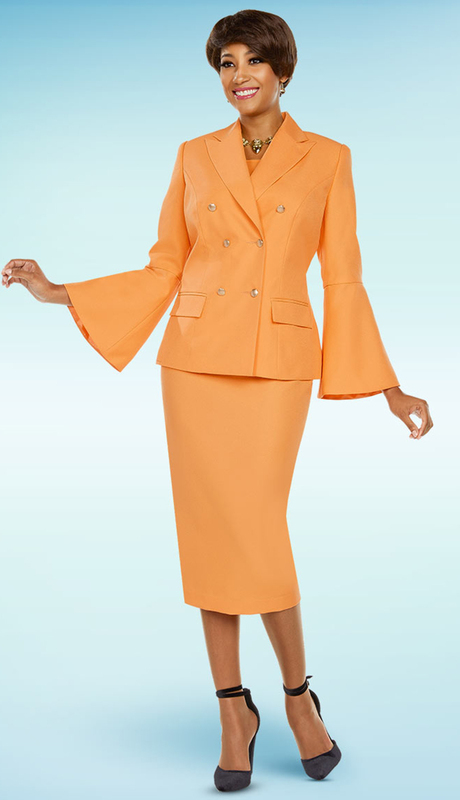 2 piece dress with hip length, collarless, 4 button jacket. Shimmery brocade fabrication. One piece A-Line dress with flared sleeves and shoulder cut-outs. Shimmery brocade fabrication. 3 piece suit. Straight skirt with button front cami. Cropped, open jacket with stitch trim. Boucle textured fabrication. 2 piece casual pantsuit. Cropped pants, off the shoulder top with ruffle tiers. 2 piece casual pantsuit. Cropped pants with ankle ruffles. 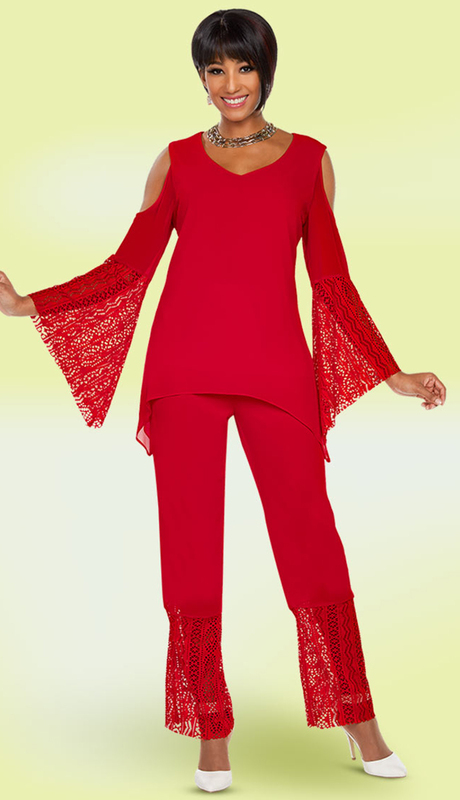 Top with ruffle cuffs, shoulder cut-outs and large ruffle over neckline and top.